Let's Do It for ME! : Christmas Greetings from ME to You! Thank you for your on-going support throughout 2014! This campaign is only a success because of you as you're the ones really "Doing It for ME!" Wishing everyone a very Merry Christmas and of course, as always, thinking of all those isolated at this time of year. Many of our group have severe ME so our thoughts are truly with you. 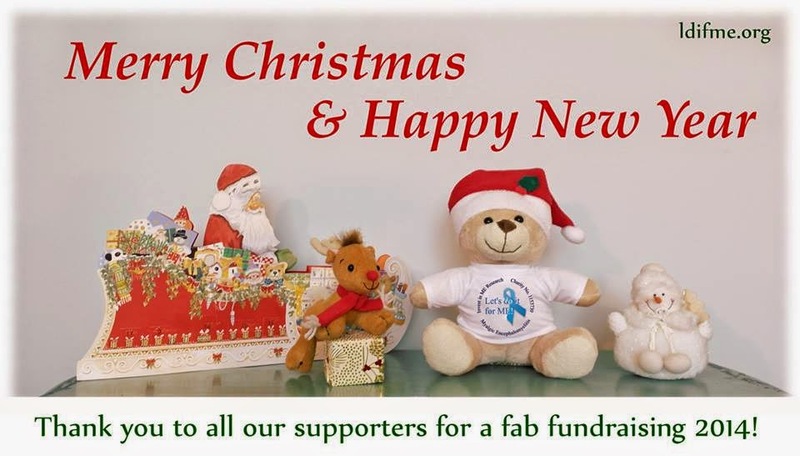 Looking forward to more fun fundraising with you all in 2015! We also wish all at Invest in ME charity a well-deserved Happy Christmas and all the best for the year ahead - our campaign exists in support of their amazing work! Invest in ME and our supporters have a firm belief that the only sensible strategy for finding useful treatments, prevention and ultimately a cure for ME is via a focus on biomedical research into the illness. Our efforts since 2007 have concentrated on international collaboration in biomedical research - something that has already been proven to be productive. In 2013 we had announced the beginning of our plans to initiate a clinical trial of rituximab following the BRMEC3 Colloquium and our magnificent supporters have achieved the impossible in 2014 and raised the initial target of £350,000. A preliminary B-cell study was made part of this project and that was started during this last year. Our foundation project at UEA/IFR continued and we have complemented this with funding of medical students who are participating in our projects by intercalating during their fourth year of study. Our intention was announced in 2014 to fund more PhD studentships and our targets have been set. The charity set up an Advisory Board of researchers to help with strategy and focus research efforts. This has met twice in 2014. With the planned four PhDs and three medical students working on biomedical research into ME a good foundation for our future aims has been built. With all the hardships that ME causes to patients and families they still believe there is a better way and 2014 was a year when patient power really came to the fore – led by IIME supporters. Despite having been set challenging targets to initiate a strategy of biomedical research, our supporters have given hope to all patients. Our thanks to the LDIFME team for the enormous work they have performed and the service to the ME community which they have achieved through their tireless efforts to raise awareness and funds via positive and innovative campaigns. Despite enormous difficulties we have, together, made things happen. As we approach Christmas we can look to the next year and express hope. We have our tenth International ME conference and our fifth Biomedical Research into ME Colloquium - which will now span two days. We would like to wish all of our wonderful supporters a very happy Christmas and a New Year full of hope - and a huge thank you for all that you have to done to help us all to move forward. Best Wishes to Everyone for Christmas and New Year!